A little while back, Melanie from Petersburgh Manor Farm in Upstate New York, was showing the sights she saw on her way to work. Other Shetland breeders with blogs have done the same so I thought I would show what my drive into town looks like. Here we are, entering on to I17. We are traveling north at this point. You can see there's a hint of the mountains up ahead. To be PC, I should say at this point that the mountains near Flagstaff are the San Francisco Peaks, with Humphrey's Peak being the tallest point in Arizona. Keep in mind that the car is at 7,000 ft. in altitude as we make our way through the world's largest stand of Ponderosa pines. Can't these people see I'm taking pictures for posterity here? Actually, the traffic is on the light side today. Here's a better view of the Peaks. It's actually a nice sight to view - one I take for granted most of the time as I do the smell of the pines. It's funny...I never smell them until I've been away for a while but it's one of the first things I notice on my way home. You just can't beat fresh air and pine trees...well, unless it's the smell of the Pacific from a New Zealand beach, or the smell of a decidious forest after the rain, or...oops! I digress. Sorry. This actually is a nice area of Arizona. I guess I should clarify that it's a nice area for me. I love visiting the deserts and it's just about a 17-mile drive to Sedona and the Red Rock Country off the Mogollon rim (pronounced mug-gee-own) through Oak Creek Canyon. But I like trees and don't do well in very hot weather, so I just make short trips to the desert areas. For you Zane Grey enthusiasts out there, this is smack-dab in the heart of the country he wrote about. Maybe this spring I'll take you all on a drive down through Oak Creek to Sedona. After the trees leaf out will be nice, I think. Maybe we'll even stop to look at the jewelry the Native Americans sell at the Lookout, and see where the creek in our pasture joins up with Oak Creek at the base of the Rim. Something to Crow, er, Rave-n, About! - One of the best ways to tell between the two, especially in flight, is that crows have fan-shaped tails while ravens' tail are long and wedge-shaped. - When a crow flies overhead, they are almost silent but a raven's wings will sound like "swish, swish". I don't have to look up to know Bran is flying overhead. I was amazed at this fact but it really is a way to tell the difference. I've never heard the wings of a crow while in flight. Only ravens'. -Ravens' bills are indeed bigger and a bit curved. They are much more powerfull than a crow's. -Ravens are much more efficient predators than crows. You won't usually find ravens eating in a corn field, while crows love corn. Ravens here in Arizona have the task of cleaning up roadside kills of deer and elk. They are so efficient that the road dept. just moves the poor beast off to the sides of the roads and in a matter of a couple of weeks you may never have known anything to have been there. 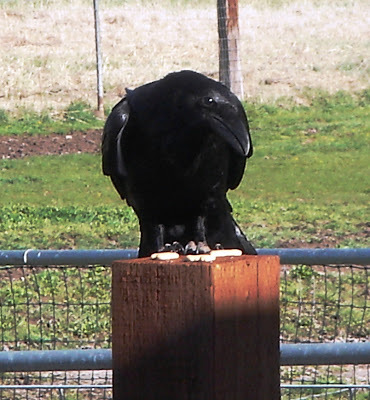 -Ravens can have up to a 4 ft. wingspan and weigh much more than a crow. Crows have about a 2 1/2 ft. wingspan. I did read that ravens can be as large as 24-27 inches long, while crows come in about 17 inches long. So, there are a few of the differences between crows and ravens. I do know that now that I have taken the time to get to know Bran and his kind I will never look at any corvid without thinking of their intelligence. I shall try my best to think kindly thoughts the next time a flock gathers in the neighborhood to have a party. I will only clap my hands in asking them to move along, take your party elsewhere, please. And as Bran himself might say..."Nevermore". 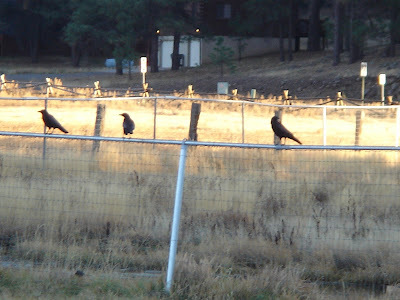 "Crows vs Ravens...a little story Crows and ravens are similar, however there are a few differences. Both birds have feathers at the outermost points of their wings. These special feathers are known as pinions. Crows have 5 pinions at the ends of their wings, whereas ravens possess 6 pinions at the end of each of their wings. Therefore, one could accurately state that the difference between crows and ravens is a "matter of a pinion". Mel ducks now." A few of you have emailed me asking if Bran (pronounced "Brawn") is still around. Yes, he is! Almost every day I see him, even on the days we're socked in with snow. On bad weather days he will "caw" at me from one of the large pines across the street. As unbelievable as it sounds I have learned his voice from all other ravens in this area. Just a few days ago, I placed a frozen mouse that had been caught in the barn out on the post for Bran to pick up. It was solid as a rock. I couldn't help wondering if poor Bran could forgive me for giving him mouse-cicles. Soon he showed up, chattering away at me about some big event that must've happened overnight as I did the morning's chores around the barn. Then he went to the post, picked up the mouse and flew over to where there was flowing water in the stream. What I saw next astounded me: Bran took the frozen mouse and dunked it up and down in the water until I saw the mouse become limp again. He defrosted it! When it was thawed to his perfection, down the mouse went, head first. I stood there, dumbfounded. What an intelligent creature he is! Absolutely remarkable. Here's Bran with his two "kids" from this summer. The Mrs. was sitting on a fence further out and I wasn't able to get her in the picture. Yes, you really can tell the differences in individual ravens if you take the time to look and see. Hmm...another of Life's lessons. Hang in there, Bran...the chickens are starting to lay eggs again so I know there will be a few "seconds" for you. And thank you for keeping watch over me and sharing yourself with me. But you really don't have to keep knocking on the roof of the Vet's van when he comes to see the cats. I'm OK...really! This picture is of one of the gems in my life - my friend, Melanie. I have been trying to write this post for three weeks without coming off as overly sappy. She is one of the most creative people I know. We came together as friends through our spinning and weaving each of us admiring the other's work at first. Of course that led to doing projects together. Over the years we've been 4H leaders together, worked for the same company, each lost a parent, seen our daughters grown and married, and gotten in-to and out-of trouble together so many times we'd give Lucy and Ethel a run for their money! For the past years we haven't been able to see each other much even though we live close by. It seemed like other things in life had to come first - and that's OK. Isn't being or having a friend include space to grow separately at times? In some ways, I think it's made me appreciate just how special she really is. She's not only a friend, but I respect and admire Mel, greatly, for deciding at the stage of life we are now in (is it "midlife"? Or some other PC word? ), to go back to school and complete a degree in Nursing. It takes guts to make decisions like that. Real stamina and pure courage. And I've always believed in her. She's intelligent, caring, creative...well, all those nifty "Scouting" terms. And she is a friend that if you need help, she's there. No questions asked. Maybe one day I can slip out of this Type A, left-brained mentality to learn how to dye fibers and yarns as "The Creative One" does...maybe there's hope for me yet, eh, Mel? *Update on the State of Repairs here at STF: It's snowing again! We're supposed to get another 12 inches of snow between today and tomorrow, after this system works it's way through. Yesterday, our low temperature was 31 F. Today our high will be 30 F. And by next week, we're supposed to warm up to about 60 F. This is just crazy! Oh, well...enough of that! Have a wonderful day today! "Watch This Space"... & Legends of the Fall! No fancy photos today. I promise tomorrow I will actually do a "real" post. I am sitting in the computer room with a large industrial blower and a very large industrial dehumidifier going on one side, and a cat who doesn't want me in here howling at me on the other side (Shadow). The past ten days have been very hectic. We found water damage to three rooms of our house from the series of storms and extremely cold weather that kept battering us. Half of my kitchen is in the dining room. Yes, our new kitchen cabinets were removed from one wall, suffering some water damage on the back bottoms. Our bedroom wall and this office's outside wall have all been opened to the framing with only the outer rigid insulation and siding on between me and open air. It's been days of boxing up dishes, pots and pans, silverware and food, coordination with contractors and reclaimation companies. The works. So, tomorrow after these beast-machines leave I shall try to post w/pictures of the latest from Oleo Acres (one of the cheaper spreads). Ya'll come back now, ya hear? I have been asked by a few individuals what the rovings from the sheeps' 2007 shearing look like. I hope this picture helps. Alphabetically from the left we have: Ailee, Amanda, Colin, Lacey, Loretta, and last but not least, Skittles. Ailee is Amanda's daughter and it really shows and feels in her fleece. She's lighter in color than her mother, but both of them have incredible softness. I have been spinning some laceweight yarn out of Ailee's roving and can hardly wait to get a skein finished and washed to see what it does. Colin's fleece has been spoken for - well, most of his and Loretta's, his sister's. I want to make something for my DH from Colin as they were the best of Bud's when Colin was small. I think they would still be that way if it had not been for so much going on this past summer. Loretta's is next. I was surprised to see that Loretta was more of a dark brown than her brother's black although if I were to put both on either side of Skittles fleece, they would both look brown to Skittles black. And last, but not least, is the Ole Man's fleece...Skittles' fleece is more coarse than the others. You can definitely tell a difference, but I have to mention that his fleece is still softer than, say a Karakul fleece, or a Romney ram's fleece. It's all relative...I have spun a skein of his roving up and while I would not wear his fleece next to my skin, it will still have many uses. And like me, he's getting more grey with each year that passes. At least I'm in good company. I will have to assess our 2007 lambs to know what type of fleece he'll throw. And we have a batch of 2008 lambs cooking as we speak. Ah, Christmas in April for this shepherd! :) I also have been toying with sending in fleece samples for micro evaluation. Whle a lamb's fleece can give you a "taste" of what their adult fleeces will be, I still wait for a sheep's first fleece after their lamb fleece has been shorn to make a determination of whether or not that individual will be a good fiber producer. All of this will be in each sheep's file and will help me make decisions about who to keep, who to sell. We can not keep all the sheep we produce here as we are not a very big operation with limited space. So I know that soon, I will have to start letting sheep find new homes. Until then I will enjoy each and every one of them. Can You Say "Frozen Frost-Free Faucet" Three Times Fast? Sorry I haven't been posting lately, but we've been mighty busy here at Oleo Acres, one of the cheaper spreads. (aka Sheep Thrills Farm) For the past few weeks, we have had one storm after another batter us. The strange thing is was that these storms came from a very unusual direction. This has caused a very big, large, humongous, giant ice dam on the north side of the house. We started noticing water dripping from the windows in the office, then in our bedroom, then making it into the kitchen. Did I mention this ice dam is really big? :) I have been on the phone with our insurance company getting everything set up for a roofer, plus a restoration company, to come and deal with this problem. We have never had a problem...until this year. Normally our storms hit from the north or northwest. This one came from the south and southwest. Instead of dumping snow, sleet, ice and more snow on the south elevation of the house where it melts off quickly, the storm dropped the snow on the north side. Not good. I will try to keep you posted...but I am heartbroken at the prospect of having to have half of our newly finished kitchen torn apart. I know they will fix everything after the ice dam is removed, but part of it is opening the walls up to make sure they dry completely before replacing damaged drywall. All I can say is "Oi!" with an "Uff Da!" thrown in for good measure. But, not being one to try to dwell on a situation that can't be changed straight away, I noticed that the storm did leave some beauty behind as well. It's not often we get Killer Icicles hanging off the bedroom eaves right in front of the windows. I let the girls out for a bit this afternoon when the snowing stopped. I could just hear Ailee saying to her mom, Amanda, "Gee, Ma...is Aunt Lacey heading back into the barn? I don't think I like this cold deep stuff." and "Psst...hey, Mom...Loretta is eating the white stuff! Eew!" Meanwhile, The Ole Man, Bluff Country Skittles, stayed guard over his Tire-Toy. But notice, Folks...HE is HIGHER than the tire! That tire hangs with a two foot clearance between its bottom and the ground! Skittles is standing on top of more than two feet of compacted snow and ice!